Each miniature has 20 to 30 layers of acrylic paint to give the scene depth and detail. 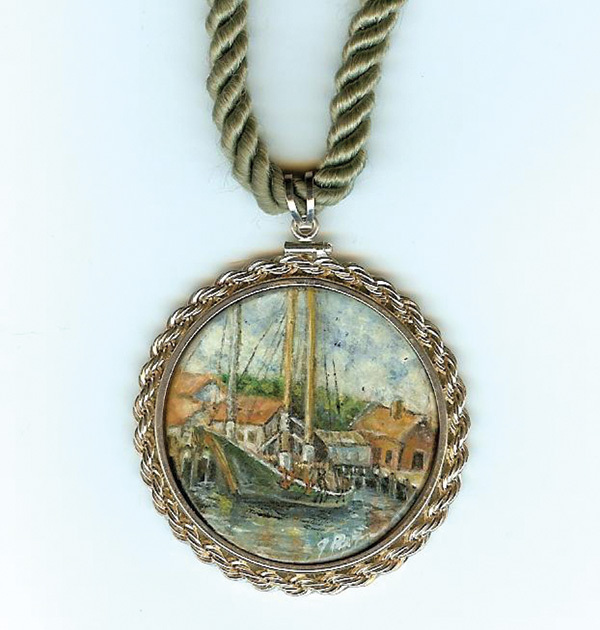 The places she’s visited often surface in Pasquini’s paintings; childhood trips to the California coast inspired this necklace. “What really draws me to the art I make are the places I’ve seen in my life,” she says. Pasquini moved to the Rose City nine months ago, and the city is inspiring her next project. She plans to paint 10 to 12 miniatures highlighting such Portland landmarks as the St. Johns bridge, the Rose Garden and The Old Church. “I love to look at the buildings and architecture here,” she says. “That feeds me as to how to paint them.” Prices of her miniatures start at $500, but vary depending on a client’s customization.